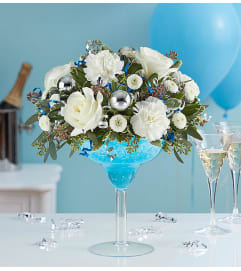 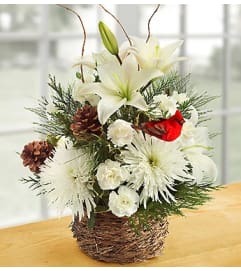 It’s no wonder this truly original arrangement is one of our holiday best sellers! Hand-crafted in a rustic bark container using fresh white & green roses, button poms, carnations and fragrant holiday greens, it’s finished off with pinecones for an extra touch of natural charm. 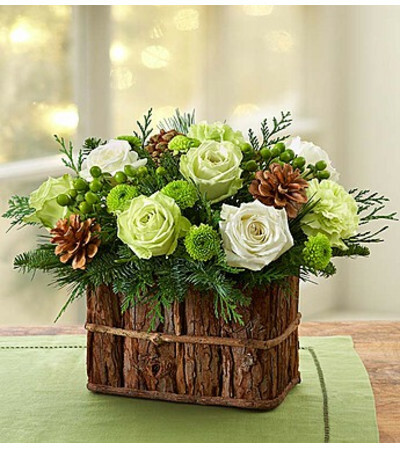 Let this one-of-a-kind gift help you express perfectly for every winter birthday, thank you or magical “just because” moment.